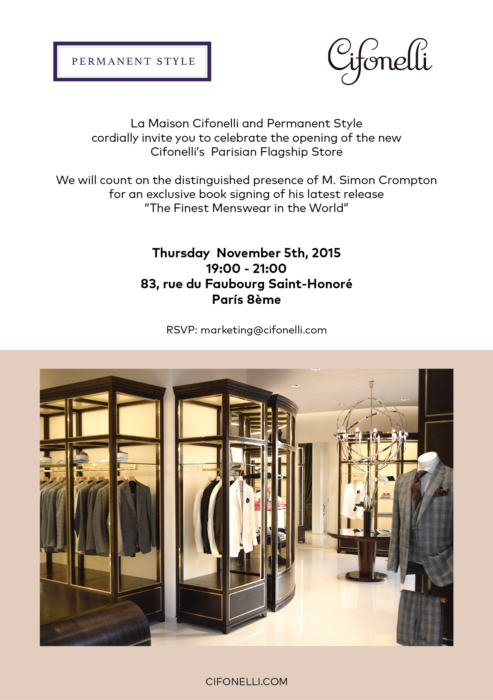 On Thursday, November 5th I will be helping Cifonelli officially open its new ready-to-wear store in Paris, with a book signing event for The Finest Menswear in the World in the shop. If you are in Paris and would like to come, please RSVP to me or to marketing@cifonelli.com. There will be books available to buy and be signed, or bring along a book you already have to be signed and dedicated. I’m happy to sign copies of Permanent Style 2015 as well. You can follow the discussion on Come to the Paris book launch by entering your email address in the box below. You will then receive an email every time a new comment is added. These will also contain a link to a page where you can stop the alerts, and remove all of your related data from the site. I’m travelling to Paris from Aug 30 to Sept 2 would their be anything I could attend ? It was really a great pleasure to meet you there. What a nice book launch !